To Cite: Aatif T, Benyahia M. Purulent Collection of Bladder and Urinary Tract: An Unusual Cause of Hip Arthritis, Arch Clin Infect Dis. 2012 ; 7(4):132-4. doi: 10.5812/archcid.15093. We describe bladder and urinary tract abscess with concomitant hip arthritis in a 64-year-old male patient on hemodialysis. The patient recovered promptly after abscess draining and antibiotics. This case is reported with a brief discussion of risk factors of this condition. End stage renal disease (ESRD) patients have a predisposition to adverse infectious events because of overwhelming uremia, which is associated with alterations in primary host defense mechanisms and increases the risk of bacterial infections. Neutrophils exhibit impaired chemotaxis, oxidative metabolism, phagocytic activity, degranulation, intracellular killing and dysregulated programmed cell death. These immunologic abnormalities are complicated by the use of immunosuppressive drugs to treat and control underlying diseases and exacerbated by nutritional deficiencies, the dialysis procedure, and the disruption of cutaneous and mucosal barriers to infection (1). Hemodialysis patients, during the normal course of treatment, are exposed to several infectious risks, and the majority of patients require at least 1 hospitalization every year for treatment of infections (2). We report a bladder and urinary tract abscess discovered by hip arthritis in a hemodialysis patient. A 64-year-old man with a history of ESRD on chronic hemodialysis presented to our department with a two-month history of progressive dysuria, fever, asthenia and left hip pain. The anamnesis revealed that the patient had been hospitalized 6 months ago for diagnostic investigation of dysuria. At the time, he had received an urethrotomy for urethral stenosis and the urine was sterile. In our department, physical examination revealed normal blood pressure of 130/80 mmHg, temperature was 38.5°C and painful limitation of hip movements. The laboratory findings showed white blood cell (WBC) count of 18.5 x 109/L (reference range 4.0 - 10.0 x 109/L) and C-reactive protein (CRP) level of 115 mg/L (reference range < 2mg/L). Blood and urine cultures were negative. A hip radiography showed a diffuse bone demineralization. 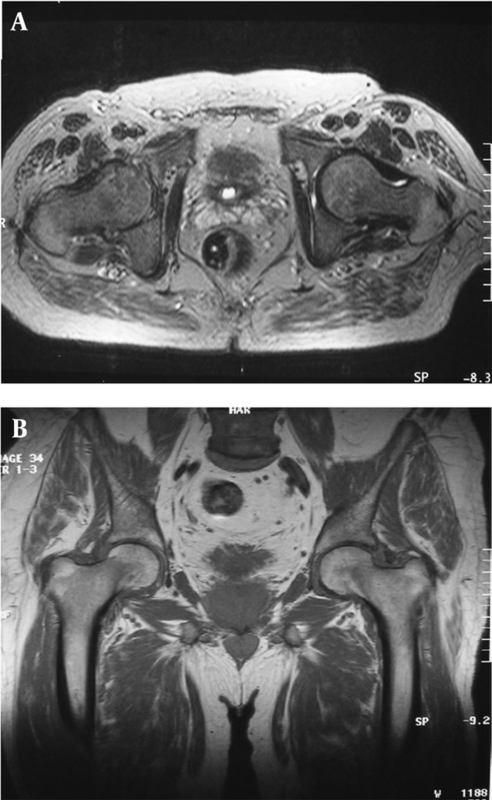 A hip magnetic resonance imaging (MRI) demonstrated long T1 and long T2 signal in bladder and left hip that suggested simultaneous bladder abscess and left hip arthritis (Figure 1). A synovial fluid leukocyte count of the hip was 9000/mm 3 and it consists of 87% neutrophils. The synovial fluid culture was negative. An endoscopic drainage of the bladder abscess after urethrotomy for urethral stenosis was performed on the third day of hospitalization. The abscess culture subsequently grew Pseudomonas aerogenosa. An adapted antibiotic treatment (Ceftriaxone, Amikacine and Ciprofloxacine) was introduced. Temperature had defervesced to 37.2 ºC and rapid recovery followed. The patient was discharged from the hospital after 3 weeks of intravenous antibiotic therapy. At her last follow-up visit, after 3 months under orally Ciprofloxacine, a hip MRI control showed a marked improvement with regression of joint effusion (Figure 2) and the patient was completely asymptomatic. Infection is a common cause of morbidity and mortality in hemodialysis patients (3). Patients with ESRD on hemodialysis have documented defects in their immune responses and infections contribute significantly to their morbidity and mortality. Epidemiological studies suggest that ESRD patients have a higher risk of contracting bacterial infections and that the 3 most commonly seen infectious complications are urinary tract infections (UTI), pneumonia, and sepsis (1). Our case presents a very rare UTI case of complications that occur after urethrotomy and discovered by hip arthritis symptoms. We could not find a description of a similar case in the literature. The higher UTI susceptibility in the chronic kidney disease group may be explained, in part, by a greater incidence of urinary obstructions, which in turn leads to infections (4), commonly seen in those with benign prostatic hypertrophy, kidney stones and urinary tract cancers (5, 6). The urinary tract, which may not be recognized as an important source of infection among dialysis patients because of their minimal urine output (7), is responsible for the highest rates of hospitalization followed by pulmonary infections. This case study indicates that a urinary endoscopy must always be done under the most sterile and least traumatic conditions as possible especially in patients with ESRD on hemodialysis. We would like to thank the continuing efforts of nephrology staff of Mohammed V Military Hospital. Implication for health policy/practice/research/medical education: In order to reduce the prevalence of urinary tract infection in hemodialysis patients, more adherence to aseptic measures are highly recommended in urinary endoscopy. Authors’ Contribution: Taoufiq Aatif took the clinical examination, collected the data and prepared the manuscript. Mohamed Benyahia supervised the case. Financial Disclosure: The authors declare that there are no conflicts of interest. Funding/Support: The authors state that there was no funding or support.